"Can't Not Do" is a catchphrase for the urge that captures the heart of effective social change agents--explaining, in their own words, their passion and drive: "I can't not do this." "It's not that I can do this, it's that I can't not." "I could not imagine not doing something about this issue." The surprising truth from the trenches is: we already have numerous proven solutions for our many social challenges; what our world needs most, and what most changes our children's future, are more people prepared and committed to act on their social impulses for the long haul. Innovation helps. Money helps, too. But greater numbers of committed people help the most. If you feel an internal, persistent call to do more for the world, Can't Not Do will help you to bridge the gap between "wanting to do" and "doing"--to access the drive of an effective change agent, to break through self-imposed barriers, to learn key principles for success, and to start seeing yourself acting as a change agent. There is no "secret sauce" someone is born with and no special club needed to be successful at social change. Rather, successful change agents share some fundamental orientations to the world and to their committed cause and, over time, learn certain lessons that help them become more effective. These lessons are reflected in Can't Not Do in seven seemingly simple questions that provide guideposts and unlock the reader's potential to make a difference for a social cause they care about. This isn't a self-help book. It's an inspiring narrative intertwined with a "street-readiness" dialogue, between the author and you, between you and your inner aspirations. These are authentic success stories, vital questions, and unconventional answers that can guide and inspire you to realize your greatest potential. 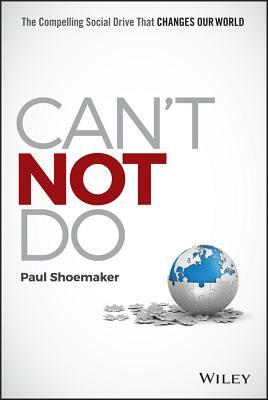 If you're out to change the world, PAUL SHOEMAKER is there to connect you to people, ideas, and organizations that matter. Shoemaker is the Founding President of Social Venture Partners International--a global network of thousands of social entrepreneurs, philanthropists, and business and community leaders in 39 cities and 8 countries. With insights from 17 years of this unique vantage point, he is a global thought leader on how individuals can be effective social change agents. In 2011 and 2012, Shoemaker was named one of the "Top 50 Most Influential People in the Nonprofit Sector" by The NonProfit Times.